← Florida Mammoth Engraving is Real? Northern fluted point from Raven Bluff site. Source: flickr usr The Arctic Archaeologist. 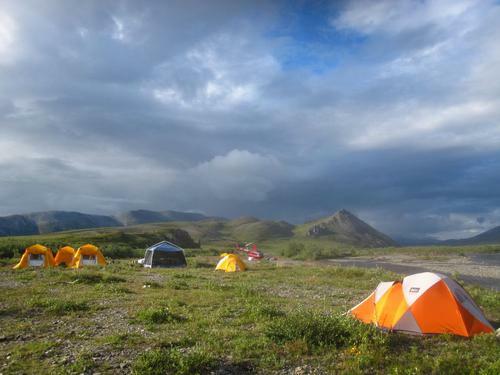 Some time ago I posted about the Serpentine Hot Springs site in Northwestern Alaska, at which several fluted points have been found, apparently dating to about 12,000 years ago. That’s about a thousand years more recent than Clovis, which is the best known of the early “fluted point” archaeological cultures from the Americas. I was interested to come across another site – Raven Bluff – which has recently come to light from the same general area, and which also has fluted points. At Raven Bluff, at least one of these dates to between about 12,000 and 12,500 years ago – also younger than Clovis, which is mainly confined to a narrow window around 13,000 years ago. Source: Hedman 2010. Site is on top of the bluff. The artifact with the most interest is the base of a projectile point with distinctive channel flakes on the base, collectively forming a flute. Classic Clovis usually, but not always, has a flute from a single flake scar. 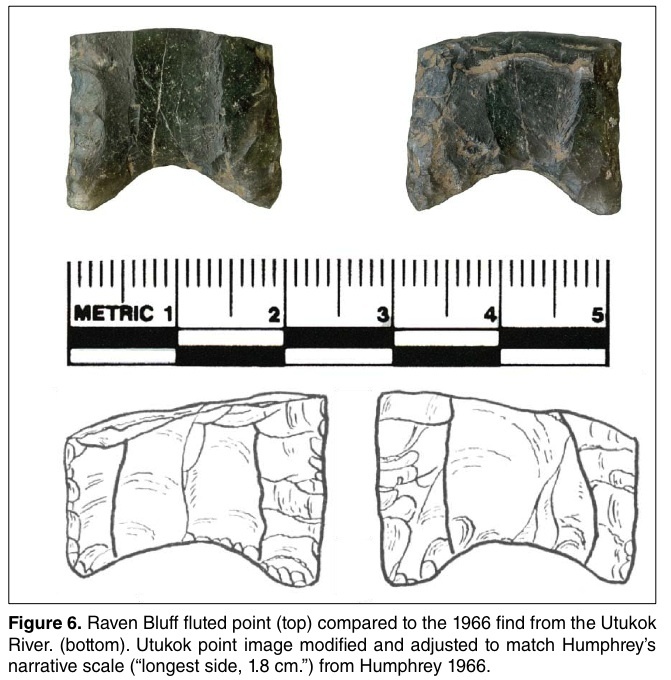 The image above, from Hedman (2010), shows the oldest dated Raven Bluff point base, which is bracketed by dates of about 11,700 and 12,600 years ago. Hedman compares it to a so-called Utukok point base, a type previously known from the northern palaeoindian tradition, thought not from such firmly old contexts. The concave base and flute makes it very reminiscent of Clovis, and while there is an understandable reluctance to call these early Alaskan fluted points “Clovis”, truly we are dealing with a stylistically very, very similar technology. These typological distinctions should be set against the splitting tendencies amongst early projectile point specialists, who sometimes miss the forest for the trees. 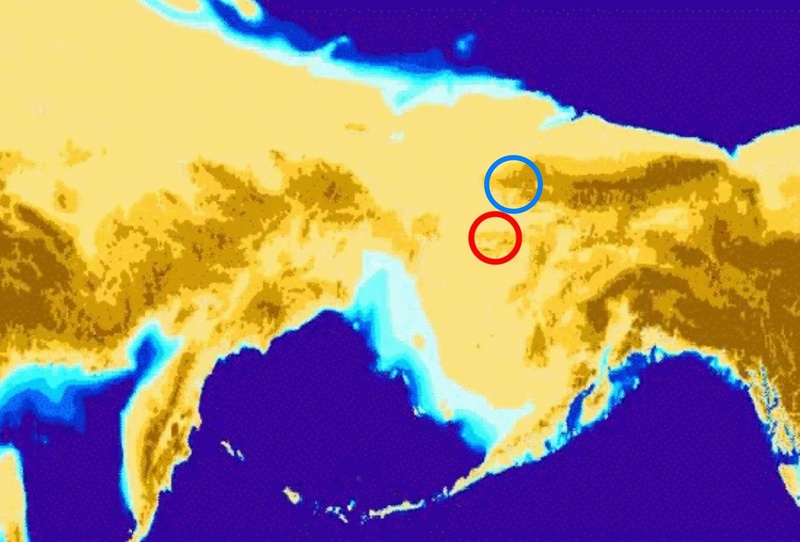 Location of Raven Bluff (blue) and Serpentine Hot Springs (red) fluted point sites, in relation to Beringia land mass as it would have appeared 12,000 years ago. Because there was some confusion last time, I’ll just note very clearly: neither Raven Bluff nor Serpentine Springs are claimed by their report authors – Bill Hedman and Ted Goebel respectively- to be “Clovis Fluted Points from North of the Ice Sheets”, which would indeed have strong interest for the first peopling of the Americas. The “Origins of Clovis” debate have always posited a central Alaskan or Yukon ancestral culture, which has never been convincingly found. Rather these sites contain projectile points which include fluting, of which Clovis is one, and perhaps the earliest, type. Fluted points are invariably early, but early points are not invariably fluted. 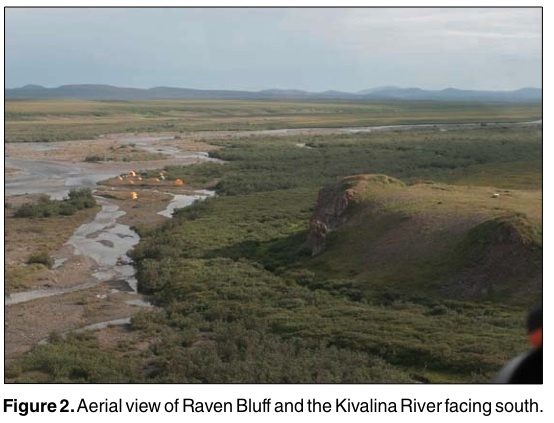 With the dates on the Raven Bluff site, it could tentatively be seen as part of a movement of people or ideas northwards from the Clovis heartland of central North America, passing up through a rapidly appearing ice-free corridor, and hence into western Alaska. In other words, there is an emerging story of a fluted point backwash from south to north, which stands in stark contrast to the original story of a fluted point migration from north to south. This itself is part of an emerging story in which, perhaps, people pass into the Americas down the Pacific coast, diffuse eastwards across the Cordillera or further south, leaving archaeological traces known as Western Stemmed Point tradition sites, and hence meet other coastal descendants moving up from the south known as Clovis. A recent article I’ve been reading in flagship journal American Antiquity by Beck and Jones, adds some interesting support to this. The authors coyly allude to some early Western Stemmed Point sites being themselves pre-Clovis, and suggest Western Stemmed is derivative of an even earlier palaeocoastal archaeological complex, currently unknown. (The article is not available online even if you have full university library access, not surprising really since American Antiquity has a very antiquated notion of the digital world and is far, far, even laughably far, behind its competitors in this regard). Anyway, in a nutshell, one reason that the origins of Clovis seekers have never found their quarry north of the ice sheets may be quite simply that Clovis originated in the south, derived, after a long incubation period, from coastal and/or intermontane and/or Central American adaptations, before arriving somewhere like the Gulf Coast or Florida Panhandle coast and rapidly spreading northwestards from there, ultimately running into Beringia. I propose to call this the Geirkztilb Model, in honour of Paul S. Martin. 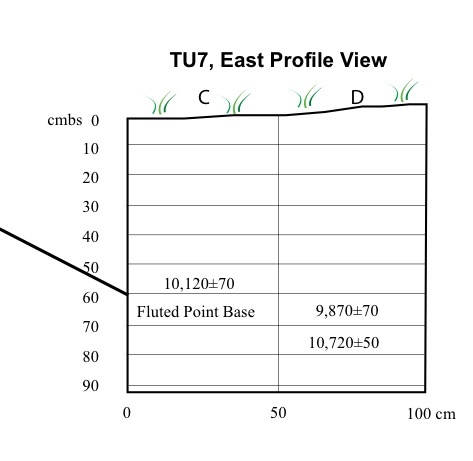 Schematic profile of Raven Bluff showing relationship between uncalibrated radiocarbon dates and fluted point base. The 9870 date is passed over without much comment by the author. Source: Hedman 2010. The main two sources I have found so far on this site are a newsy, informative release by Craig McCaa, and a short preliminary technical report by project director Bill Hedman. Both are PDFs found via the Bureau of Land Management. Two other sources for this site are a couple of pictures of excavation and some fluted points put up on flickr by user The Arctic Archaeologist, and the diary/blog of a participating Colorado elementary schoolteacher, Karl Horeis, who filed some good reports for his students including lots of photos you can browse here (they are mixed in with a lot of other pictures, so try to figure it out…). Anyway, it is an interesting site which, if it helps us better understand the phenomenon of fluted projectile points, will be very interesting to follow. If it can also help understand the relationship between fluted points north and south of the ice sheets then it will play a long-running role in figuring out what, exactly, to make of the increasingly enigmatic Clovis archaeological culture. This entry was posted in alaska, Archaeology, Northwest Interior and tagged alaska, clovis, first peopling, paleoindian, pre-clovis, Raven Bluff site. Bookmark the permalink. All around nice – nice site, nice pics, nice artifacts. Fluted stuff has never really excited me, but it is pretty. can this be termed ‘backwash theory’ ? The “stubby” Clovis points found in Alberta have always been seen as evidence of post-Pleistocene northward movement. This stuff and the Mesa site material seem to fall out of the same washbin, to continue the metaphor. If anything, Clovis distributions and metrics point to an origin in the southeastern states (see for example, Anderson and Gillam 2000 American Antiquity 65:43-66), really to my way of thinking, they more or less sprang soaking wet out of what is now the Gulf of Mexico onto Florida. Hi Mad Dog, yes, I should make it clear, the Clovis backwash idea is not a new idea, but these fairly well-dated, extreme NW Alaskan sites are new and show the extent of the backwash, probably extending into now-Asia. What is of interest to me is revisiting the fluted points and seeing them as a broadly used, continent-wide technology of uncertain function, and by reducing the focus on Clovis/Folsom then perhaps eventually getting more at the heart of Clovis than at the heart of archaeologists. And what separates mere backwash from Clovis First models (which could incorporate post-Clovis backwash) is the overall South to North pattern at a North American scale. More grist for the “Soaking Wet” theory mill, anyway, and it isn’t like the south coast of the Caribbean is an archaeological hotspot – could bear some more attention. I think TaimaTaima may be a bit of a Chernobyl locally – I have no opinion on the site but it is a lightning rod for controversy, so why not steer clear! I just got an email including, with reference to the northern fluted points, to “call a spade a spade”. Hereby resolved: Clovis points were actually the business end of digging sticks. The other thing I learned from this site was how to make schematic stratigraphic profiles using Excel and a grass icon. Nicely played, Dr. Hedman. Though, more seriously, who should win the splitter vs. lumper distinction on the fluted point question? 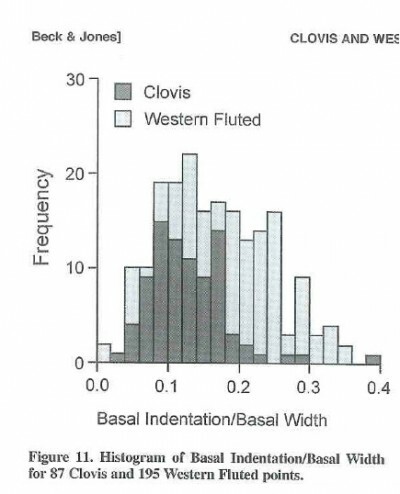 Beck and Jones go to great lengths to separate out western Clovis from Clovis Clovis based on depth of basal concavity. This seemed like splitting hairs to me. If the idea is that Clovis may have shared a common ancestor with Western Stemmed Tradition, and if Western Stemmed is older, then why not have fluted, stemmed points as an intermediary/transitional form? Other than none of the right age have been found, so far, that is. 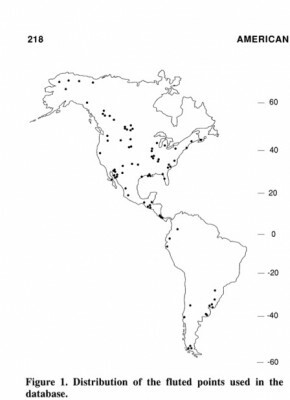 Consider the distribution of fluted points in the Americas, from Morrow and Morrow, American Antiquity, 1999. creating expecations for what a pre-Clovis site might look like in the west/coast could enable its discovery just by looking through museum collections. There is no indication whether they have considered the presence of a marine component to the diets of the animals whose bone they are dating. This could make a significant difference to the dates. Anadromous fish are common in the Kivalina River now (according to a quick google search). If any of the bone they are dating is from bears, and if anadromous fish were present when this site was occupied, then the dates may require marine carbon reservoir calibration. I would like to know more about the dating. APM — yes it would be desirable if they gave species for the creatures they dated – I presume they know this and will report in the fullness of time. If a marine reservoir correction is needed (and keep in mind, at time of occupation the site may have been hundreds of km inland, but indeed salmon can handle that!) then it will probably be a hard correction to make. Just talking out of my yeeha here but terminal Pleistocene & Younger Dryas times there is a lot of fossil water with entrapped carbon flowing around all over the place as the glaciers melt out. Who really knows the effect that has – marine reservoir needs to be worked out locally anyway, and paired shell-wood type samples are hard to come by at the best of times, and more so for early deglacial times when shorelines are mobile and invertebrate colonies may or may not be established. Anyway, its a good point that might end up being a nightmare! I hope not because this is my new favourite site. Those darn migrating shorelines. Looking at the site map above, it seems very unlikely to be a salmon stream, even then. The drainage flows into an ocean blocked off from the Pacific. I don’t know enough about Arctic Char to know how far inland they spawn, or what kinds of natural obstacles in rivers will end their upstream run. My guess is if this is indeed hundreds of km from the ocean, then the fish will not have got that far. Mind you, the river also has Dolly Varden which apparently feed annually in the ocean these days. I think your favourite site might be safe from dating hassles. Its great progress that there are now two seemingly well-dated Alaskan fluted point sites. I think it pretty much strikes a death-nell to the Beringia – southward spread of Clovis idea. There indeed seems to be a great deal of typological hair-splitting with the fluted points, though there are clear regional-temporal trends in some attributes its seems. The multiple-flute thing has always been considered a ‘late’ thing, but many of the classic Clovis sites – Blackwater Draw, Gault, as well as lots of the western sites seem to have their share of multiple flutes. Western Stemmed, how many well-dated well described sites of appropriate age are there? Haven’t many of the proponents of this tradition included Windust, which is much too late to be of consequence and I think is clearly related to the Cody complex of the middle palaeoindian tradition? I’d like to see some hints of the bizarre technology of Clovis lithic technology in Western Stemmed and I don’t think its there – the reliance on overshot flaking to quickly thin biface preforms for instance. The large polyhedral core-and-blade technology is also missing. Both these are easy to overlook (well, maybe not the cores, but they are comparatively rare). For a Clovis progenitor, I’m sure that there is something else we haven’t even seen yet, probably underwater. The reference in Beck and Jones to Galm and Gough 2007 is actually to Galm and Gough 2008 – I suspect they only saw a chapter out of Roy and Marty’s projectile point book or else they might have wanted to also cite the stemmed points from Haida Gwaii Younger Dryas and/or Duncan McLaren on Stave and/or Croes et al’s review of Puget Sound including Clovis – all of which are relevant to their argument, I think. They probably had a chapter when the book was projected to be 2007. The Beck and Jones paper is, however, a really good review and bringing together of a lot of grey literature and site reports and so forth and making a good case that WSPT should really be elevated to central interest in the peopling of the Americas debate. Anyway, re: your point – the technological differences between WSPT and Clovis are pretty huge, not just in biface form but in reduction strategy and it is hard to imagine two such near contemporaries being directly descendent from one another, in either direction. So, yeah, to my mind it is suggestive that they share a common ancestor, perhaps a coastal one, currently archaeologically unknown; it is really hard for me to accept WSPT as a direct, almost immediate Clovis descendant which I guess was/is the orthodox model for many years. It’s a very different beast from Clovis it seems. DF and I have been ruminating on this quite a bit of late. Incidentally, Beck and Jones also review the use of crescentic bifaces in WSPT which I understand is an interest of yours and R’s after they turned up at Williston? If you want to, uh, enhance your chances of finding a copy of the article on the ground, then let me know but maybe you have it. Long time reader, archaeologist and YVR resident. Greatly enjoy the blog to keep up to date on whats going on in my own backyard. The use of the word “evolution” struck me regarding the discussion of projectiles. Lithic complexes are the products of repeated sets of gestures on the part of the maker. They reflect the choice of the between functionality and aesthetic. We know a good knapper can make several different types of lithic, all they have to do is see an example. Hence it’s discordant to see them grouped into species like classifications where western stemmed = panda and clovis = grizzly and we have to look at Ailuropodinae/unnamed pacific culture to figure out where they came from. Fundamentally material culture is not biological and to reject origin of one techno-complex based on dissimilarity to another strikes me as very weak grounds for dismissal. Ultimately, culture change or stasis is driven by the decisions of the people present at the time. I think it’s more productive to ask ourselves, why would a person stop making western stemmed and start making clovis (or vice – versa)? What social – technical factors could be at play here? What would drive a person to do more than strap a flake on an atlatl and have at’er? Ahhhh, whats the point of $ spent on journals if you don’t read them? I vaguely recall that article that I thumbed-through and put aside to read later. Right! It goes back on the toilet tank lid at the office tomorrow! (the location encourages readers but discourages theft, but what exactly did you mean by ‘enhance your chances’??). The crescents are an unusual tool form shared with Clovis; but with this exception, I’d say the ‘common ancestor’ of W. Stemmed and Clovis is several generations back. But neither I nor Roger (freshly back from Africa and going down the stairs as i write this) recall any crescents from Williston. Perhaps you are remembering some of the heavily retouched side-scrapers on large blades? For years I always thought of Windust points as pretty exotic in terms of their flaking – based on illustrations. Then I got some casts from LithicCastingLab – they have twisted axes, and no attempt at collateral flaking; basically ‘poor relations’ of contemporaneous Alberta and Cody complex points from the Plains. However, I think they still share more similarities with these, and the Hell Gap/Agate Basin progenitors, than they do with the long, narrow, contracting stem points of the North Coast. A purely subjective interpretation, but hey! Can anyone point me (pun inadvertent but what the heck) in the right direction of some good examples of Western Stemmed tradition? I’ve been meaning to get a copy of Roy Carlson’s projectile text to see if it offered anything enlightening but no luck so far on the birthday gift/anniversary/Christmas present front despite some rather broad hints. Do you mean you’re looking for references to learn about the WSP tradition, or to buy a specimen(! ), or a cast, or? Sorry, it’s not totally clear to me. Roy Carlson and Martin Magne’s projectile point book is indeed excellent, and very reasonably priced, and though not specifically about WST though it does cover the Haskett points, for example, in the Galm and Gough paper. It’s not a coffee table type book though, mainly written for a student and professional audience. The image quality is not uniformly great, which reflects the good price. Otherwise, just let me/us know what exactly you’re looking for and I am sure someone can help out. I’m not quite sure why someone with any legitimate archaeological interest would want to buy one (well, perhaps aside from repatriation); are you running into this sort of problem on a regular basis and getting a tad touchy on the subject? So: I’d be interested in sources for images of (Canadian source) points which fall typologically into the Western Stemmed Tradition. Any help much appreciated. Sorry about the misunderstanding – I just know you as “Mike” and, well, a lot of people come by the blog with different motivations so I was just sussin’ it out. You know, it might be an interesting post to this blog if I stuck it on the front page sometime: ‘Examples of good photos of WST specimens needed for photographic database, send to Mike@example.com” If your site is non-commercial, anyway. Is it a web site or a CD or? Anyway, let me know, it could be interesting to see what could be scared up from the readers of this blog. Morley – huh, I was pretty sure I talked to Roger once about Crescents from up there but most likely I have it wrong. 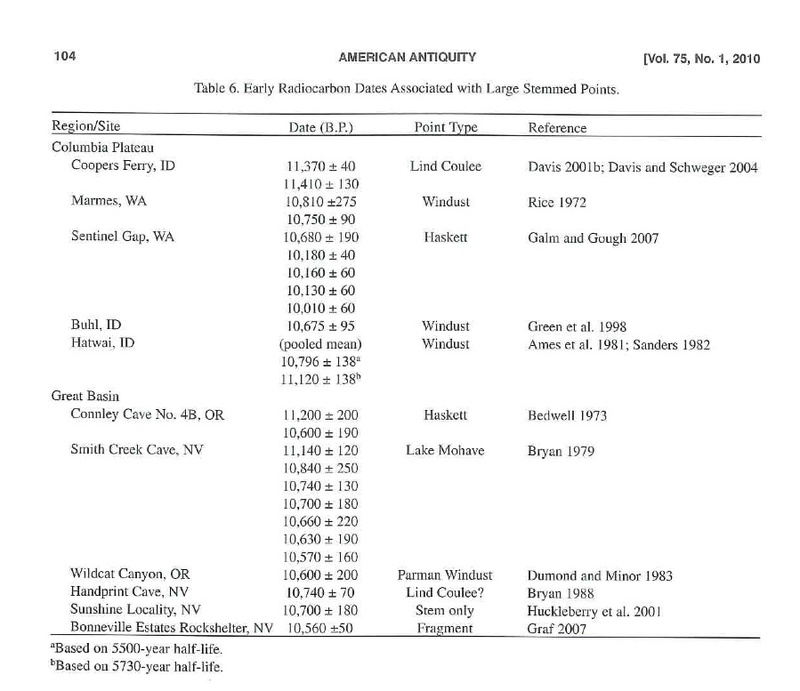 … Is that Clovis is closer to Denali than it is to Nenana, which contradicts what a lot of experienced archaeologists would say. Now, traditional taxonomists in biology had many of their trees uprooted by genetic approaches, (and many were also confirmed), but in this case we are looking at two much more similar ways of approaching the same problem. So I am undecided on the particular point. Archaeologists are by nature scavengers of other discipline’s theories and methods and are prone to making superficial analogies, as you rightly point out. But as for the utility of projectile points for analysis, and your other comments – I alluded to the notion that Clovis includes large prismatic cores and WST does not. In my view his goes beyond the reverse engineering any experienced flintknapper can apply to their craft. Indeed, modern replicative flintknapping is, Ishi aside, almost entirely reverse engineered. However, the routes to the finished form may differ significantly, and this is why looking at the entire cradle to grave reduction sequence or chaine operatoire – the cores, the debitage, the blanks, etc – may be informative. I mean, I could replicate a Clovis point with a dremel tool, but the reduction sequence would tell the story. In this respect, Beck and Jones actually comment on these different reduction sequences and I think we see something different again, but related, on the coast. So when a person is entrained in an entire approach to lithic reduction, from nodule to artifact, a chaine operatoire in fact, then to say, well “people had choices” is really to deny the cultural inertia of successful material culture. I wouldn’t want to go too far along a path that rejected morphological similarities as a basis of tracing relationships, if it were accompanied by consideration of the entire suite of technical operations and material products and, especially, byproducts. Nor would I think that choices in point style are made independently of the interlocking maze of cultural behaviour and environmental circumstances. Sometimes choices are indeed fairly constrained, and we could do better by trying to understand the dynamic processes which underlie continuity and less time understanding apparent changes. (Note of course that archaeological culture does not equal “ethnicity” or even “cultural culture” – that’s the trap that leads to Projectile Point Sociology). This is useful to me because we see in Haida Gwaii certain assemblages in which microblades, commonly seen as remarkable, exotic technology, are simply added to assemblages while much of the rest remains constant. In these cases we can track the in situ development of microblade technology and perhaps arrive at some of the “choices” you allude to being made, in a very fine grained manner thanks to some remarkable stratigraphy. Well this is a long comment which strays from the topic some and also from the comments I am responding to, but a useful one for me because I hadn’t really clicked on Buchanan/Collard specific point about microblades not being the be-all/end-all of choosing which assemblages to compare. So something to add to the thought-bag. Hey Quentin, hope all is well. Just to set your mind at ease on the crescent thing, we did indeed discuss it and that discussion revolved around a fragment of a chalcedony biface that although unusual, was not complete enough to accurately guess its original shape. When I had a look at the photos of crescent examples you sent me I wasn’t seeing a very close comparison. Anyways, Ill keep my eye out for anything else when I get back to looking at rocks all day. These new sites are very cool, thanks for the post. To add to the Clovis/Stemmed Point/microblade muddle, the High River, Alberta microblades and microblade cores are found associated with Cody Complex (Scottsbluff points) material, although in surface context. If you look at Sanger 1968 in Plains Anthropologist you will see in addition that the blades are not so “micro”, and a number are made of obsidian, as are some of the Scottsbluff points. Thanks for the reference, Mad Dog. Maybe what I wanted to say in my long comment above was that skilled flint-knappers could probably do whatever they wanted, so determining what they wanted is crucial. And survival would be something they might not know they wanted, but was a circumstance they couldn’t avoid. Alice: huh, check out this skinny little flake that came off when I was burinating this flake. Skinniest damn flake ever. Bob: yeah the guy said that long time ago he heard people did that. Alice: one time I saw some long ago peoples’ crap on the ground, lots of little flakes like that, huh. Bob: yeah, but kind of fussy eh? Bob: but remember that time we got stuck on Big Smokey without any decent frickin’ rock in the bag? Bob: yeah, fussy long ago assbackwards people. huh. They must have spent their lives gluing flakes. Gosh. Before taking an unexpected turn and ending up on the Sunshine Coast a few years back, I was a magazine editor, newspaper reporter, and even had a handful of books published (history stuff, local; I guess folks still refer to me occasionally as the Stanley Park historian). The projectile point database isn’t academically critical although a number of teachers use it as do several state archaeology offices along with flint knappers (I’m a member of KRU) and, inevitably, collectors (some of whom are actually pretty nice folks even if we don’t see eye-to-eye on commercializing artifacts). It would take in excess of 11,000 pages to print it out although, for the sake of the planet’s trees, I hope no one ever actually tries it…. Thanks for posting this article. Also, I think that it is worth pointing out that the V-shaped indentation of the base is very typical of western fluted points, including those found down in Arizona, and Sonora. And, as a flintknapper, I can say that creating such a sharp indented “V” takes some effort, because of the nature of the sharp angle, and the straight edges, versus typically blunt tools. Also, as another person pointed out, there is no reason to overlook the fact that fluting was known from a very early date, throughout the Americas. So, there should be some common denominator for the early widespread presence of fluting. Also, many have compared the mobility of the North American Clovis people to the mobility of Eskimos, who maintained a single cultural zone, over 4500 miles, from Alaska to Greenland. But, the key to the Eskimo’s amazing mobility was their sled dogs, which could carry them a hundred miles per day. At some point, should we stop and consider the possibility that maybe the First Americans were not actually walking everywhere, as has been assumed for decades? If, like the Eskimos, and the people of the Andes, they had some other means of transport, then far ranging kill sites, where large amounts of meat was processed, and carried away, would make much more sense. Also, the fact that they left virtually no trace of physical structures, or hardly even used caves, while prefering open air locations near fresh water, would also make much more sense. Another thing which is worth pointing out is that seeing that the Clovis peoples reached the Alaskan-Siberian zone, by this early point in time, then there is no reason to assume that the First Americans did not start crossing from the New World, back into the Old World, at a fairly early date. So, any genetic studies, made on modern day Siberians, which point to a low incidence of New World genetics, should be suspect, and not taken as proof that Native Americans descended from Siberians, but rather that some of the Native Americans slipped back into Siberia, possibly as early as ten thousand years ago. All the identified bone from the site, as analyzed thus far, is caribou. Re: genetics, I would add to your comment what I think is a much-needed concept for early period archaeologists to really internalize: Beringia was a place to be, not a “bridge”. People did not get into single file to walk across some sort of causeway. Beringia was the size of western Canada – 1700 kilometres wide (north to south, that is). It was a homeland for people who did not know, could not now, that there was a massive double continent to the south. Thus, to return to your point: when sea levels rose, a Beringian population was likely displaced to points both east and west! The latter could indeed produce a technological and genetic backwash into Asia. Anyway, it drifts away from my area of expertise, but I think the central concept: Beringia was not a “bridge” to the people who lived on it, it was a place to be in its own right. This mental model is a necessary antidote to “North American-ist” or “America-centric” views of the peopling process. Re: mobility, yes people can be much more mobile than we might think and there is plenty of ethnographic information to that effect. But, we need not necessarily invoke that, since peopling Beringia and the Americas only requires very high mobility if we subscribe to the very narrow time frames of Clovis-first. I’d also add, if we consider boats (river canoes as well as coastal craft) then people can be mobile and move their stuff, kids, grannies, around with much more ease. Kane: thanks for the information. I am looking forward to (somehow) seeing a full report on this site. Download the slides, put them in “slide show” and slowly click through the animations. If the clovis culture was here first which i do not beleive, why is there a heavier concentration in the midwest to the east coast and from canada to the gulf? Then in the western region? It’s a good question!. Some archaeologists have suggested that the frequency of Clovis points shows a positive relationship with today’s population, implying more people looking, or more land disturbance. But the real, related question is: why does it appear that the oldest Clovis sites are the in the south and southeast of North America, and not in the Northwest, as would be consistent with a Clovis-First entrance through the ice free corridor. It’s pretty hard to conclusively date these sites to the narrow degrees of certainty to really tell, but insofar as there is a pattern it is opposite to the one predicted by Clovis First models. In any case, the Rave Bluff and also the Serpentine Springs fluted point sites commented on here are not assigned by their authors to Clovis, and are presumably a slightly more recent projectile point style derivative of Clovis. Now, that might be splitting hairs but it is how the investigators describe them. All the same, it shows the practice of fluting is probably a South to North phenomenon as well, which is not totally inconsistent with Clovis-First but certainly is not good support for it either! I’d also like to take this chance to welcome readers from the comprehensive Polish language archaeology blog http://archeopasja.wordpress.com/ , whose editor asked if some material from this site could be translated and worked into her posts. It looks like a great blog and makes me want to learn Polish. In the meantime, there is google translate. Great blog information exchange here. I have lots I could add but because I have no PHD and most of those here don’t want to hear what I have to say, I will just observe this and other topics on Q’s very informative blog.